The site for learning about electronics technology. Use the menus above, or select a topic from the preview boxes below - you are no more than three clicks away from some of the best regarded information on what you need to know. Visit our brand new section on Thyristors and learn about SCRs, Triacs, Diacs including Alternisters and Sensitive Gate Triacs. Build our low voltage demo circuits to explore AC control; fully illustrated with working schematics and videos! Already one of the most popular on line electronics education sites, with around 300 pages and over 1700 illustrations and animations on a wide range of electronics topics, Learnabout Electronics has grown into a major international educational site, used by millions of independent learners, major educational publishers, armed forces training establishments as well as colleges and universities all over the world. Used for electronics classes. To find out more about the Learnabout Electronics site just click here. Learn the basics of electronics - Ohm´s Law, simple circuits and resistor networks - both series and parallel explained step by step. All the essentials; voltage current, conductance and resitivity explained. How does temperature affect resistance? Its all here, together with component recognition for 4, 5 and 6 band coded resistors as well as SMT codes and simple fault finding. Some of the most comprehensive resistor data on the web! 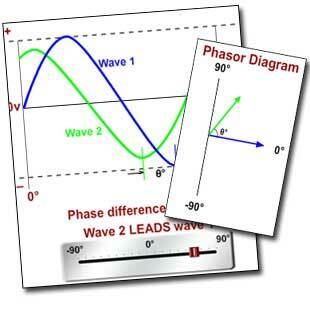 Our pages about AC components and circuits are designed to teach the basics of AC Theory in 11 easy to learn modules. Use them as a complete course, or study any individual topic, including capacitors, inductors, reactance, impedance, waveforms and phasors. Every module is backed up with a paper version to download, print and keep. The online pages also use interactive animations, adding to our popular transistor animations that are now among the most sought after diagrams of their type on the web. 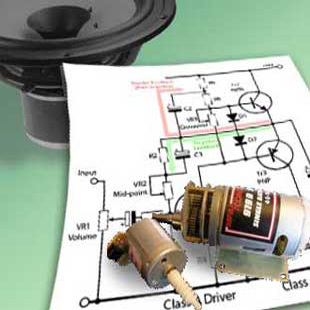 How oscillators work and what they do. Radio frequency and audio frequency circuits, astables, monostables and pulse width modulation are all here in our popular learnabout modules. Learn about oscillators step by step, or choose any module and learn just what you need to know. How to design and build working circuits for yourself. How to test oscillators, plus links to relevant electronics industry oscillator data! Learning about electronics? Then you need to know about components, including diodes, FETs, bipolar transistors, thyristors triacs and diacs, opto-coupled devices and basic semiconductor theory. Find full and easy explanations of many common types. 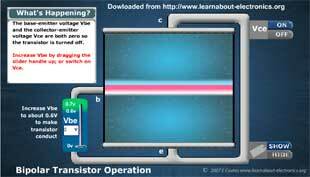 Check out our animated diagrams to make transistor operation clear. What´s the difference between common emitter, common base and common collector connections? Find out the right way to test transistors in our Fault Identification Section and get help with those maths problems you need when starting out in electronics. 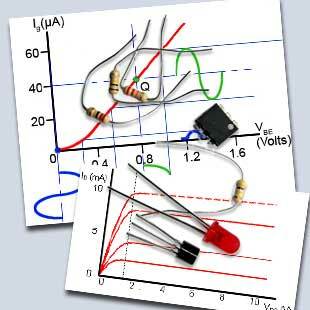 Learn how to design and build a working transistor amplifier with the minimum of maths theory. Amplifier classes explained from A to D, together with multistage amplifiers, practical power amplifiers and op amp circuits. Get to grips with negative feedback, input impedance and bandwidth control. 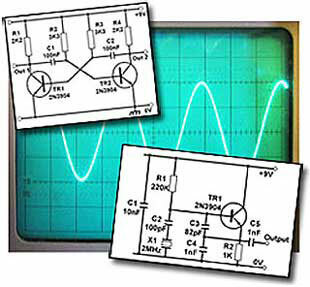 Everything from basic amplifier facts to complex professional designs is here on Learnabout Electronics. Every circuit (just about) needs a power supply, so you need to know how power supplies work. Learnabout these vital circuits - everything from Basic Rectifier Circuits to Switched Mode Supplies, and from basic components to integrated circuits - all in our easy to learn modules. The power supply modules are also extensively linked to key pages with detailed information and basic terms you need to be familiar with. Use the power of learnabout-electronics’ hundreds of pages of electronics information to guide you through the stuff you need to know, and important data sheets on power supply components are also just a click away to link you to manufacturers data. Start learning real circuits now with Learnabout Electronics. Learn-about Digital Electronics with FIVE MODULES packed with information and circuits on digital technology! Start with binary arithmetic - Boolean Algebra, Karnaugh Maps, all the essentials you need to know. Step by Step instructions for simplifying Boolean expressions, plus FREE TO DOWNLOAD software to make simplifying Boolean a breeze! Logic Gates, logic families and digital circuits explained, from basic gates to complex circuitry that makes computers work. Multiplexers, adders, counters, shift registers and more. Download free Logisim software and over 60 interactive simulations of common digital circuits.